What followed was an exercise in just how I could make this sweet little desk work, despite the fact that the top and middle drawers are indeed faux, and what appears to be two bottom drawers is actually a single file-size drawer. My first quick conclusion was that, frankly, this desk was nothing more than a glorified (little) file cabinet. No place for pens, pencils, ruler, stapler, or any of the other tools and supplies usually stowed in a desk. However, despite that concern, I also knew my tendency toward streamlined desk spaces, if my Pinterest board was any indication. Tables-as-desks certainly win there. For me, that meant three key components were necessary to make this One Drawer Wonder work: two divided wooden boxes and a file box. The file box takes up the bulk of the space inside the single drawer, and holds enough hanging folders for our day-to-day document filing needs. (For vital and long-term document storage, we use a fire and waterproof safe.) The divided wooden boxes are custom made from Design Craft Industrie and stack one atop the other alongside the file box inside the drawer. The top box holds, in it’s smaller section, more-often used items such as a stapler and two book dart tins, one for rubber bands, the other for book darts and paperclips. In its legal-envelope-size larger compartment, I keep mail to be processed, bills to be paid, stamps, envelopes, and stationery. It also holds a sticky note pad, checkbooks, and letter opener. 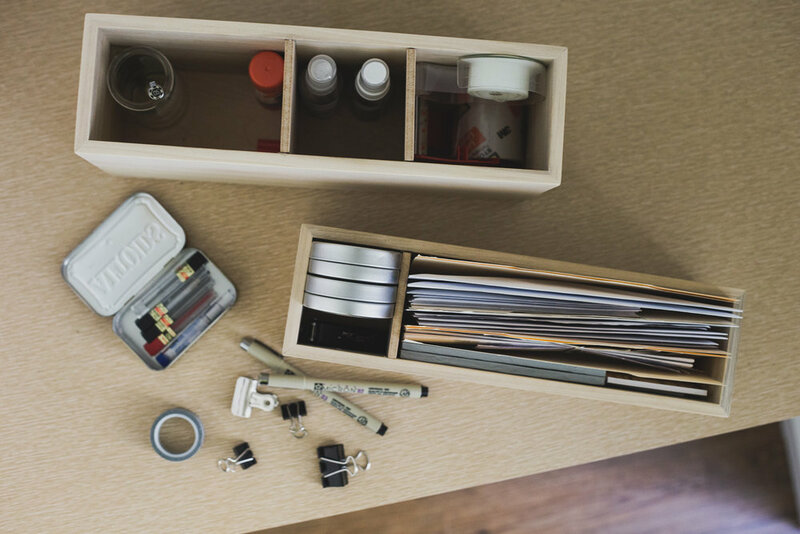 The lower box is divided into three compartments and holds lesser-used items such as tapes and glue, screen and eye glasses cleaner, ink pens, binder clips, and pencil lead.